Every year, November 9 and 10 have a sad resonance for me as a Jew and especially a German Jew. Since November 1989, I have been baffled at the inexplicable coincidence of the date for Kristallnacht and the fall of the Berlin Wall. As a Berliner, my father always looked at the wall and the communist regime as a blight on his home city. On two separate visits to the city, I passed through Checkpoint Charlie and over the Berlin Wall on the elevated train known as the S Bahn. It was clear and vivid to me that the German Democratic Republic was a giant prison. Every year in Western Germany, June 17 was marked as a national holiday. On that day, workers in Berlin and other cities demonstrated and rioted in 1953 before the revolt was put down by Soviet troops . Thirty six years later the wall fell. 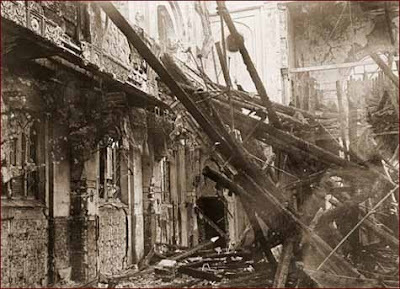 Kristallnacht was the end of centuries of Jewish life in Germany. My family had been there for four hundred years subsequent to fleeing Spain. They spoke German. They listened to German music. They thought in German. When I was in mourning for my father, I covered the mirrors, donned cloth shoes and sat on stool instead of a chair for seven days, as is our custom. Down the street, there were weddings and bar mitzvahs. It was not my place at that time. I do not know why G-d chose November 9 and 10 as the days for the Berlin Wall to fall. Any other day I would have rejoiced at the nail being driven into the coffin of communism. But today, I can not. Those in houses of mourning do not go to a wedding. Those in a house of rejoicing change from their festive attire before visiting those who grieve. I hear the joyous sounds from the street. My shades are drawn Today is a day for my silence. Let others rejoice. I can not. I remember the Berlin Wall having visited Berlin in 1980 and seen the differences in the 2 Germanys first hand. I also remember that after Kristallnacht not one World Leader made any move to condemn Hitler for the action. The silence was deafening. Just as the silence today is deafening regarding Hamas' bombing of Israel.